Iranian women’s struggles date back to 150 years ago. They have paved a long and tortuous path in the struggle against several dictatorial regimes who denied women’s rights. The misogynous rulers did not even allow the history of women’s struggle be registered and even fully narrated. What our generation knows of 1.5 centuries of struggle of the women of Iran is only a small part of her heroism and bravery and a meager portion of her suffering and torment retrieved from heavy distortions and censorship. A glance over this glorious struggle shows that Iranian women enjoy a strong historical backing. They have been through many ups and downs before reaching a point where they can play a pivotal and leading role in the Iranian Resistance, today. It is in the evolutionary continuation of this path that they would certainly turn the page of history in their homeland and establish freedom, justice and equality after overthrowing the ruling clerical dictatorship. In the 1891 Tobacco Protest, women’s staunch resistance forced the shah to withdraw the concessions he had granted to the British. In the starvation era, women attacked wheat warehouses and divided the wheat among the hungry. The Constitutional Movement (1906) was a turning point when women broke out of isolation of their homes and took to the streets. They formed various associations and civil societies, fought backward traditions and pursued scientific and political advancement. During their 150-year history, women have always paid a high price to protest the ruling tyrannical regimes. They sought to have freedom of choice, enjoy the right to determine their own fate, and they did not budge on these issues. Women’s movement in every era has always drawn its driving force from women’s knowledgeable choice. Having achieved a reasonable level of political understanding, women intervened to resolve the financial crisis of the nationalist government of Dr. Mohammad Mossadeq. On March 8 1952, women and girls converged from various cities in the capital and staged a glorious gathering outside the National Bank of Iran (Bank-e Melli Iran) to buy money orders and sell their belongings. This gathering provoked other social sectors and got them involved, too. Such political and cultural growth among women escalated during the rule of the Pahlavi Shah, yet because of the heavy repression and the omnipresent police state, women had to resort to clandestine activities and joined underground progressive and democratic groups. Courageous women like Ashraf Rabii (Rajavi), Marzieh Oskouii, Azam Rouhi-Ahangaran, Mehrnoush Ebrahimi, Fatemeh Amini, Ashraf Ahmadi, and Massoumeh Shademani endured much torture and captivity or were sent before the firing squads. These women thus registered the real image of Iranian women in history with their struggle. The student movement in this era was impressed by the presence of young women and girl students. In the course of the anti-monarchic revolution, women’s participation in the Iranian people’s democratic struggles reached new peaks. In February 1979, the nation witnessed bravery of women in taking over the Shah’s military bases and centers of repression. The leadership of the 1979 Revolution, however, was usurped by Khomeini who could not tolerate freedom of thought and women’s freedom of choice. In less than one month, he issued an order which made wearing the veil mandatory for women in government offices and departments. Iran’s freedom-loving women staged a massive protest on March 8, 1979, and said a resounding NO to the compulsory veil. In this way, women quickly learned of the misogynous nature of the mullahs and started engaging in social and political activities to protect their rights. The movement rapidly spread among the masses of people but the religious fascist regime also stepped up its repression of women. 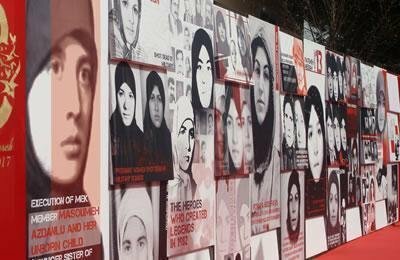 In the 2.5 years after the revolution, dozens of girls supporting the opposition People’s Mojahedin movement were killed or wounded in attacks by government-backed club wielders. Nassrin Rostami, Mehri Saremi, Sima Sabbagh, Fatemeh Rahimi, Somayeh Noghreh-Khaja, and Fatemeh Karimi were high school students who lost their lives in such attacks. On April 27, 1981, the huge street march by 200,000 mothers terrified the regime. On June 20, 1981, when Khomeini ordered his revolutionary guards to open fire on the peaceful demonstration of half-a-million people of Tehran, women chose the honor of resisting the regime instead of submitting to it. The clerical regime began its mass executions the same day. The first series of those executed were high school girls as young as 16 and 17 who had not given even their names. Similar incidents took place every day all across the country where Iranian women and girls put up a staunch resistance and the regime revealed its cruelty. The atrocities climaxed on February 8, 1982, when the leaders of the Resistance movement inside Iran, Ashraf Rajavi, Moussa Khiabani and 18 of their comrades were slain in an unequal battle with the regime’s revolutionary guards. Ashraf had joined the democratic struggle when she was a student of Physics Engineering at Tehran’s Industrial University. She was among the last group of political prisoners freed from prison 10 days before the revolution. She was a trailblazer who paved the way for active participation of Iranian women and girls in the democratic struggle. Ashraf and eight other prominent women in the PMOI, the pivotal force of the Resistance movement, were engaged in this epic battle. Similar confrontations took place in the following years with women playing a prominent role. One of the moving aspects of struggle in these years belonged to the women who left their children to fight for freedom. There were women, like Ashraf Rajavi, who hid their infants in a safe place during attacks by the regime’s guards, and women in prison who had to endure ill-treatment and torture of their children before their eyes. There have been many instances where children were split from their mothers and taken away without giving her any information. So, women’s participation and role in such crucial scenes and historic turning points, and the endless sacrifice made and the heavy price paid by tens of thousands of women and girls led to the emergence of a new female character that opened the way for her equal participation in the leadership of the Resistance movement. It is with such great backing of awareness and faith, sacrifice and selflessness, courage and heroism that today, the women of the Iranian Resistance are leading the movement and have turned into the force for change. A force that has not been crushed despite 38 years of brutal subjugation, but has grown stronger and more determined. And it will write and guarantee the future of a free Iran. If it succeeds, this experience will be considered a great achievement for the universal equality movement and for all women of the world. And it is going to transform all human relations and lead it towards genuine maturity.